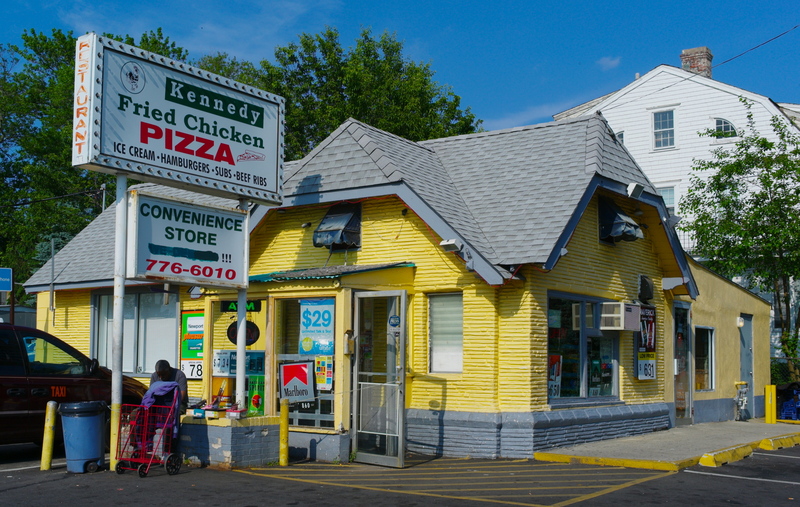 No More Bumpity-Bump at Sunset Avenue, and other news from the north country. By Paul Goldfinger Re-posted from 2013 but still relevant. 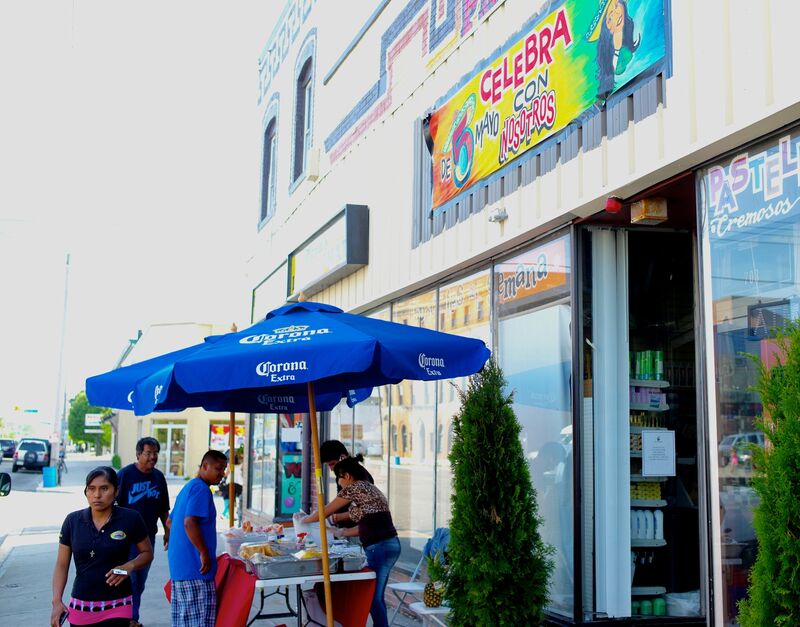 Not much has changed to 2018, but there are signs that Guadalajara-in-New Jersey boulevard is beginning to change for the better. Almost every day I have an automobile adventure as I set out for Wegmans. The first part is heading north on Main Street, a multicultural showpiece in Asbury Park where driving is a challenge. To begin with, bad driving is a norm there. You must watch for abrupt lane changes, especially by cab drivers; jay walkers (it is the Jaywalking Capital of America;) oblivious drivers who stop cold and block one lane of traffic; giant pot holes, and getting caught behind cars trying to make left turns–like the guy who can’t wait to get to “Meat ‘n More ” or the driver who missed the left signal at Asbury Avenue—sort of the Times Square of AP. Sometimes the fire engines come screaming out of their garage onto Main Street. I guess the main virtue and problem along that stretch is the the high volume of cars and people in a relatively small area. 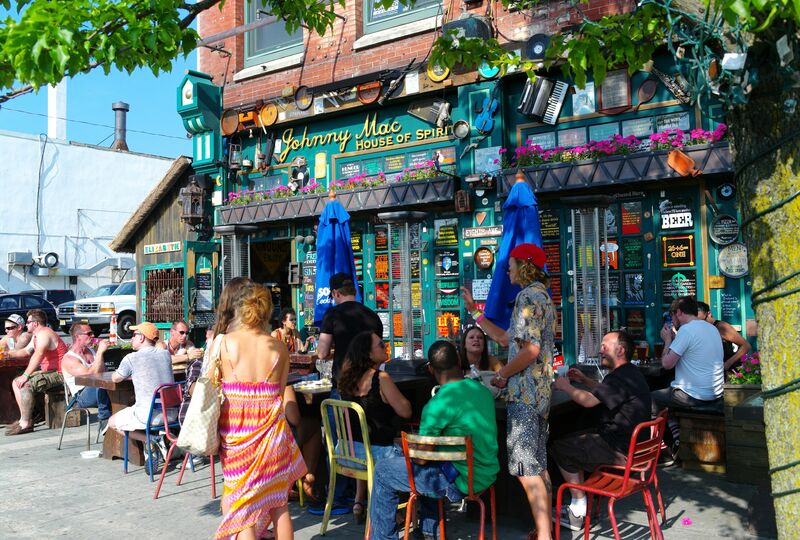 Johnny Mac’s on a Sunday afternoon. Main Street. © Go there if you are interested in speed dating. Go to OG if you want slow dating. You also pass the offices of the Coaster, a newspaper that specializes in old news. If it’s Saturday in the summer you can stop at the Sunset Avenue Farmer’s Market, but watch out for people crossing with their bags of tomatoes. Also, be alert for the tourists pulling luggage as they head from the train station to the Grove, or the school kids, or the crossing guards, or the day workers, or the little Mexican moms shepherding a few kids to school, or the cars turning into the two Dunkin’ Donuts. If you, like me, enjoy people watching, Main Street can be of great visual interest, but it’s like texting when driving, don’t take your eyes off the road. Sometimes I am drawn into beautiful Sunset Park because I see something worth photographing. 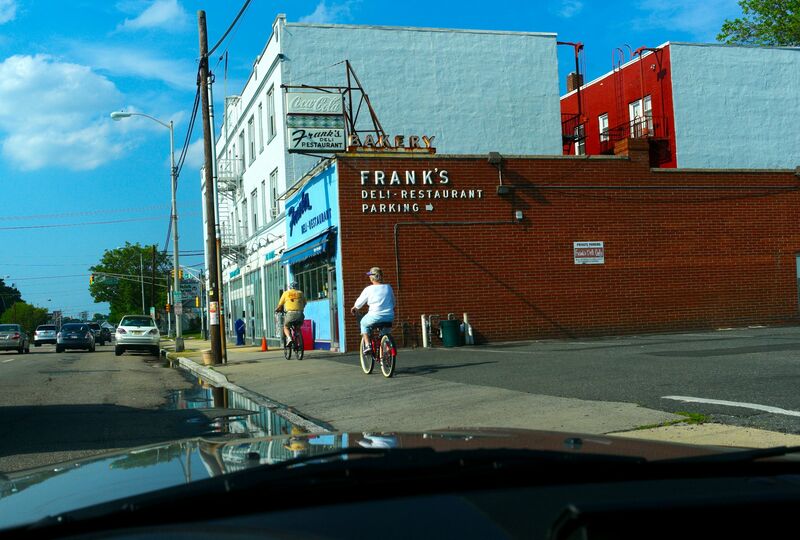 You might also be tempted to turn into Frank’s Restaurant where everybody goes for breakfast including cops, contractors, politicians, bloggers, realtors, homeboys, wayward Grovers and stylish types from across the border on Cookman Avenue. And another distraction is the cacophony of loud music emanating from stores and cars and trucks: Salsa, hip hop and then Beach Boys from the white guys in the Jeeps. Ribs, pizza, burgers and fried chicken. It’s convenient. Once you have survived that leg of the trip, you need to turn left at Sunset Ave by the Dunkin Donuts. You go one block and you meet the train tracks. I always slow down there because of the “bumpity bump” that threatens my wheels, tires and suspension. I once saw a guy swerve hard to the right to avoid the rattling wheels. One time I tried that, and the driver behind thought I was turning right, and a moment later he was passing me on the tracks. So, a few weeks ago, work began on that Sunset Ave section of track. After a couple of weeks of not remembering and then having to make multiple U-turns past a stadium that I never saw before, I found an alternate route, but soon the work was over. I guess the stadium is the home of the Asbury Park High School Bishops. Be the first to tell us why their mascot is a bishop, and you will win a prize. 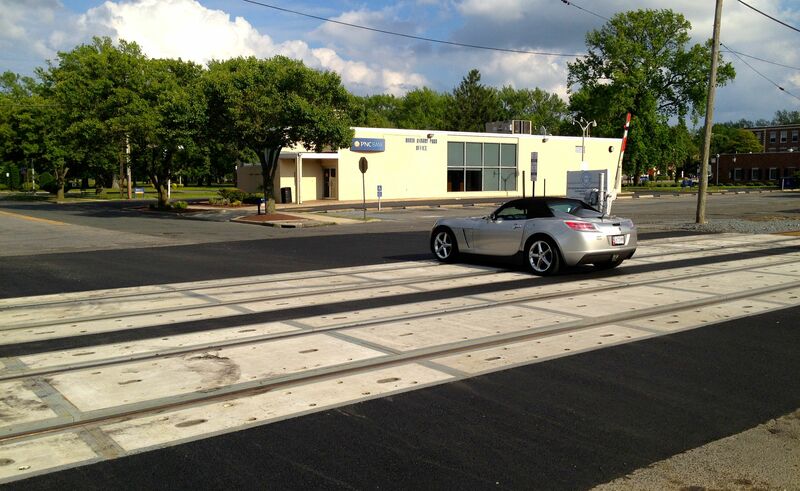 Now, there is no more clickity -clack when you drive over the tracks. It is as smooth as silk. After that, the trip to Wegmans is very nice—that is until you get to Rt 35 in Ocean—white bread country—where there are other issues, but we’ll leave that for another time. So take another look at Main Street as a place to visit and to have dinner. Send us a restaurant review. It actually is a much more fascinating place than Soho-by-the-sea which is downtown vertically to the east, and a lot less spicy. * Credit to Ernest Hemingway for the “movable feast” line. In answer to your question: because Francis Asbury was a bishop. After the ACLU fuss about Neptune High School graduating in the Great Auditorium, why aren’t they raising hell about naming a public high school mascot after a senior official in the Methodist Church? Iit’s a Main Street like no other. I’m a bit shocked that you comment that The Coaster specializes in “old news”. That seems a bit harsh as Ellen works hard to provide current coverage of news for AP, OG and Neptune. Mascot: You win. Prof. Google says that Bishop Francis Asbury was a high ranking official in the Methodist Episcopal Church. He received the honor of having the town named for him because James Bradley, the founder of Asbury Park, was his friend. Anyhow, Mascot, go to Smuggler’s Cove on Main Avenue where our prizemeister Rich Lepore will find something for you to enjoy. Sal. It was a laugh line, but most of their news is old. If they really want to provide “current coverage” they should have a web site where they can post the news daily–providing access to subscribers with passwords. Paul somewhat related to re – no more Bumpity Bump..
We will be having a harder time soon getting to our beloved Wegmans. This Fall, the Sunset Avenue bridge that separates AP from Wanamassa is going to be torn down and rebuilt.